Justin Shorb of Flock University just notified us that the Italian (online) skydive magazine 90 percent just put the latest issue of its magazine online. 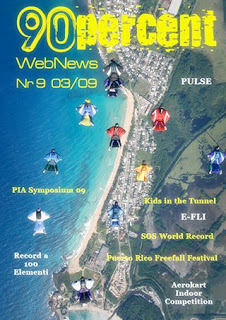 This month they are running a wingsuit covershot, and article (page 29) on the wingsuit flying that happened at the Puerto Rico Freefall Fest, just a few weeks ago. The magazine features wingsuit pictures by acclaimed wingsuit pilots and photographers Matt Hoover and Scotty Burns. Go to the website, or click here to download the pdf.